I love the last one. The first two are a bit meh. Edible baby jokes are getting old. Love the last one so much I tweeted it. Get me, eh? With the newfangled t’interweb. The baby one’s silly because it’s obviously one of the Mardi Gras king cakes and they don’t want people to think that lucky baby tradition thingie is made of fondant or something. Trying way too hard to find humor in a simple warning. skinner, I was thinking a similar thing. Well, not about the cousin stuff, but the fact some guy was actually able to get it up for (and come in) that girl? in the first picture. Christ. The last one is super adorable. The one with the King Cake is dumb…. 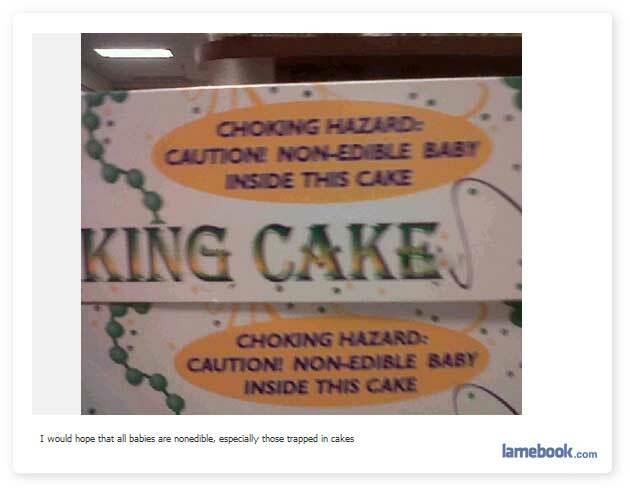 all king cakes have a plastic baby hidden in it… that’s what a King Cake is! Duh. while the third one is funny, why is the world would you pay to have professional photos taken, then wear a snogtee with a T-Rex on it? Look out buzzkillington, lulz is trying to move in on your joke-destroying territory. Get back in there with some conversation destroying lines, correct some grammar, get your head in the game. Also I threw in a wrong there for you buzzkillington, I know you can’t resist. The second one puts a whole new spin on the phrase “one in the oven”. @Lulz not everyone knows about King Cakes. I for one didn’t, yet I found the picture entertaining nonetheless. 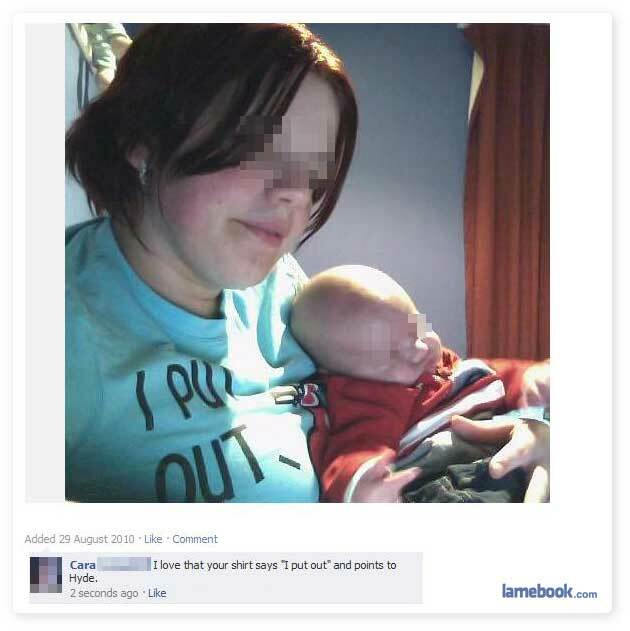 Wearing the “I Put Out” shirt while holding your baby is kinda funny… Naming your baby Hyde, however, is not. Is laughing hystericaly because I know the people in one of the pictures!! If anyone would end up on lamebook…it doesn’t surprise me they made it! Of course she puts out. Duh. I was one in the last picture. It was taken that way on PURPOSE, as an inside joke between my husband and I. But, thanks for the lulz. You’d better remove everyone from Facebook “slc1”. You can’t be too sure who it was! Maybe it was Onduv or Daem! …Your judgement…not so strong. Dont worry bman, I did. Thanks though. Yeah, the king cake one is not funny at all. I’d think all babies are inedible. Har har har. I’m hilarious. Boooooo. Either you all got together without me and decided to pretend like there was a third pic or the bastards deleted it. Douches. Wow this is kinda funnt. Yeah trolls can troll, not like you guys have much better to do with your life. and worldpervert I bet you got off on the photo. trollololol. Damn I hate it when I miss one! GODDAMIT, another hilarious/cute/sickening/arousing photo missed. Damn! They took the funny one out! I’ll give it to omnimiere that “her” picture is more coincidental than lame. But then she ruins any sort of forgiveness I may have allowed her by doing the following: “funnt;” “would of;” “xD” (twice); and presumes to call us trolls…Besides Steeeever and sprucay, nobody here is trolling but her saying Word gets off to her picture, and that’s a lame troll. Way to try to rebuild your self-esteem. Go back to your cave. As for trolling, I think I made my point. Maybe I should start writing more typo’s yah? Anders, thank you for having my back, buddy, but my care factor re whatever the fugly is on about is less than zero. omnimiere You just ignore them all, their just mean internet bullies, I’ll be your friend. We can talk about how you put out over a nice relaxing cup of tea…. Ignore the green steam and suspicious smell coming from your tea, that’s how all tea looks in England.